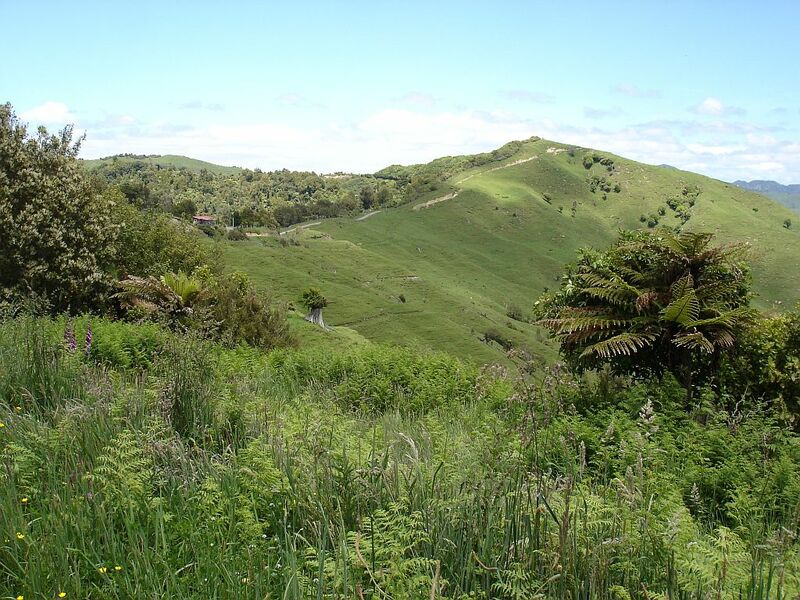 The northern end of Motu Road starts a few kilometres east of Opotiki on SH35. 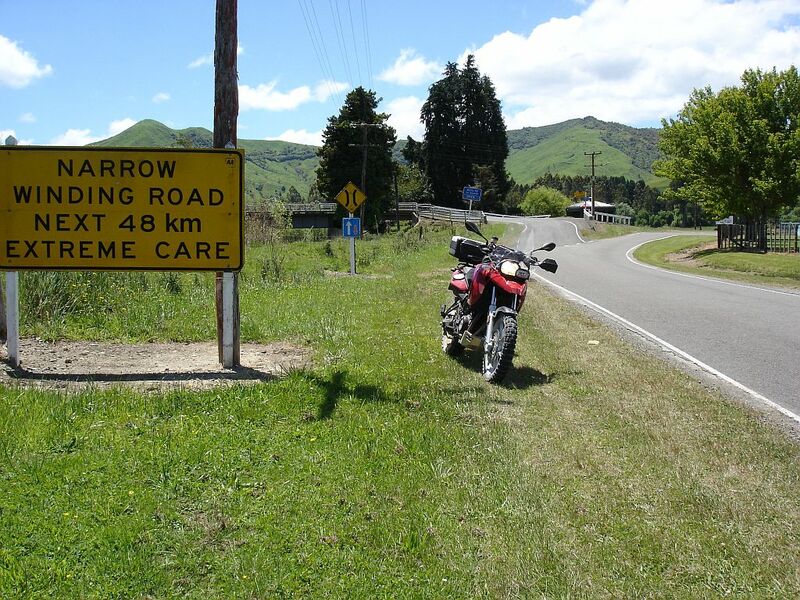 The sign gives some warning of what lies ahead – “Narrow winding road next 48 km extreme care”. 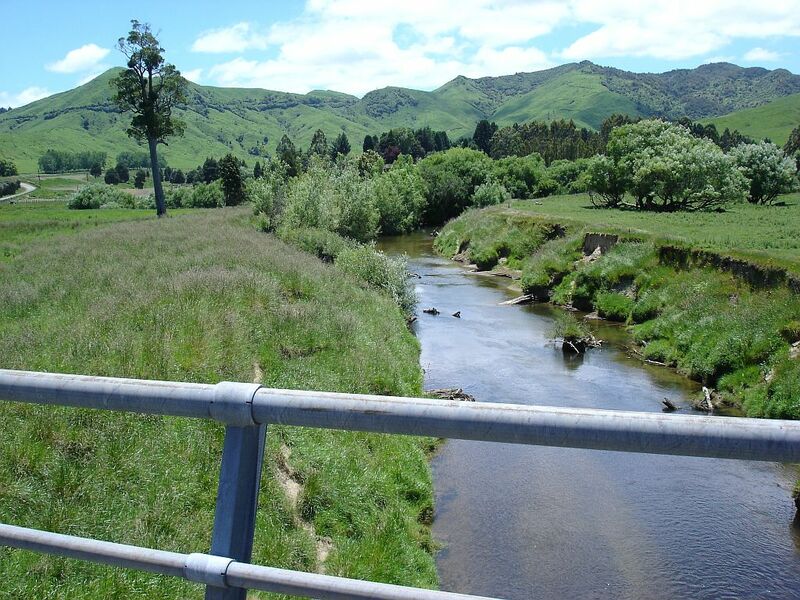 The road follows the Waiaua River for some distance. 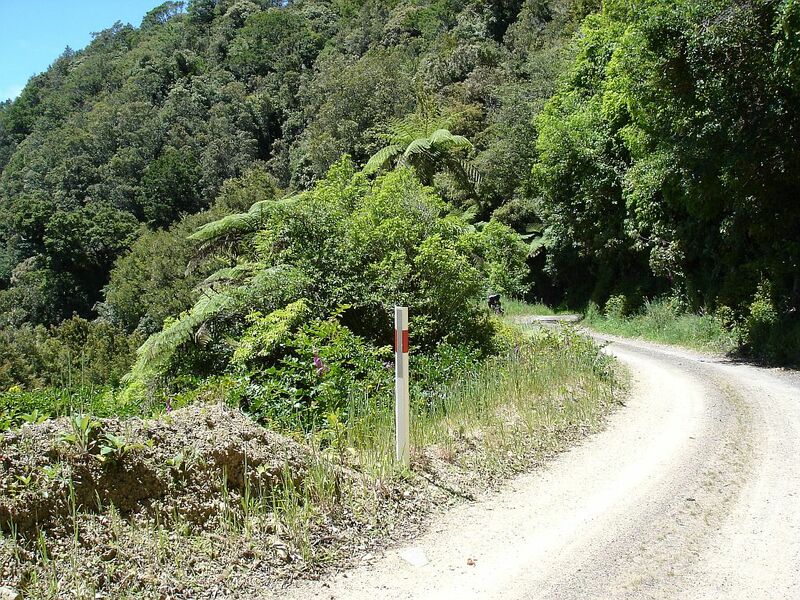 There is not much room for error, with the road edges washed away in places, and with near-vertical drops of up to 100m or more in places. 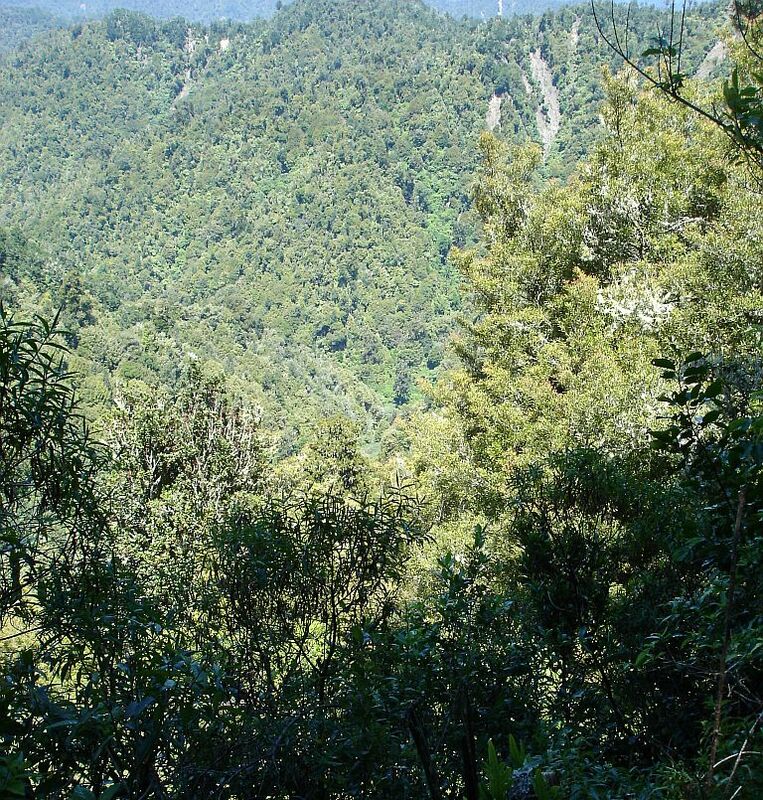 The road can be seen across the steep hillside in the upper part of the photo. 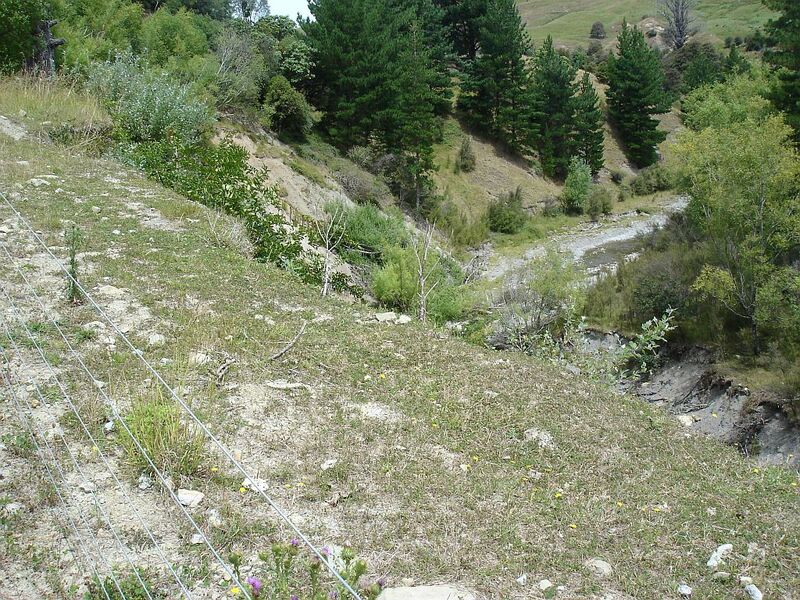 The grey patch in the centre is the river edge, with the river more than 20m below road level. 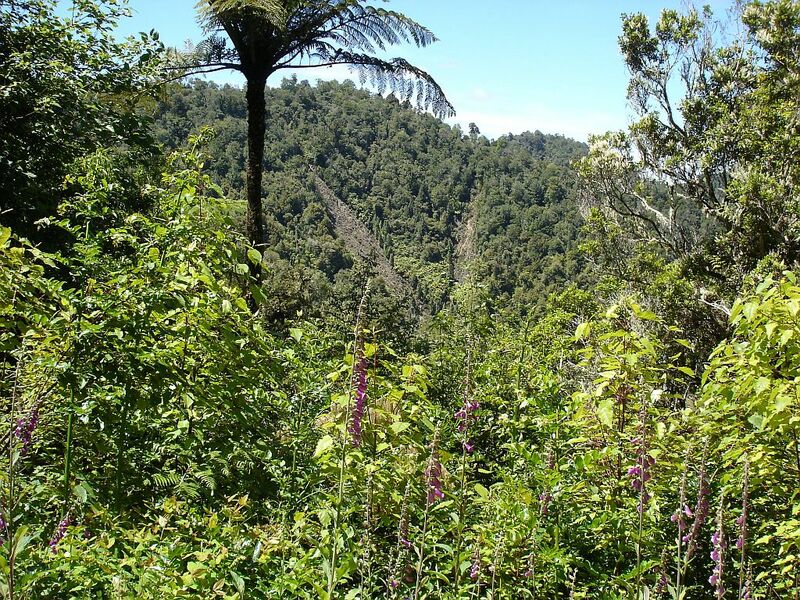 The forest and the scenery is stunning to see. 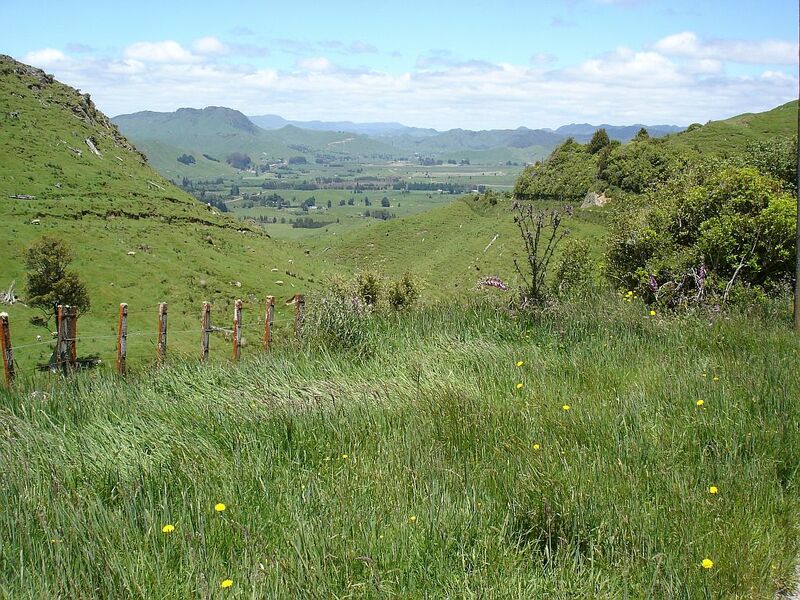 There is still some land being farmed in a few of the valleys alongside the road. 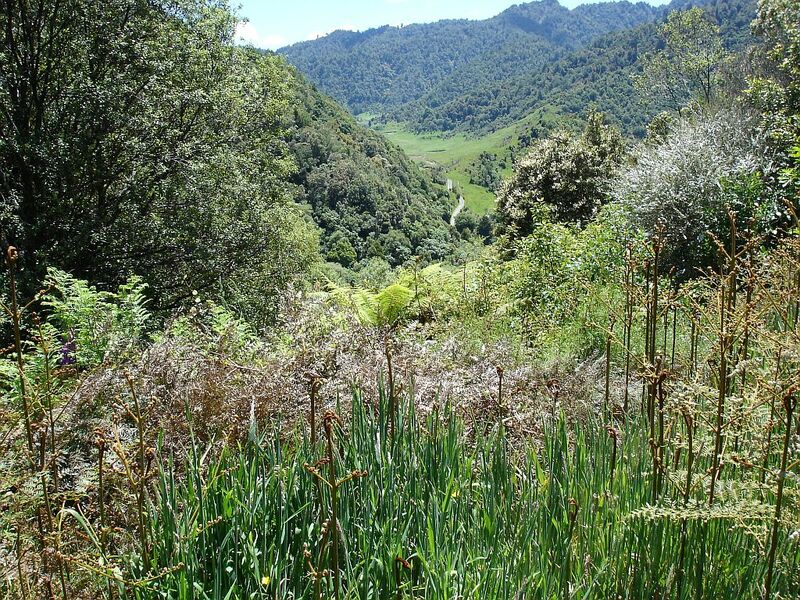 Hunting wild pig and deer is practised in the forest area. Apparently some hunters cannot distinguish between wild pigs and domesticated pigs. 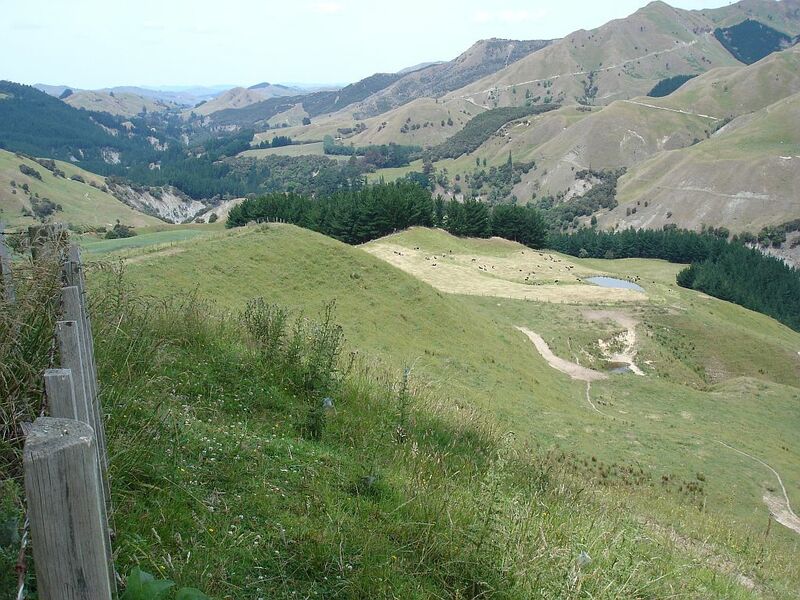 About halfway through the 48km winding section there is a road leading to more farms in a valley off to the left. 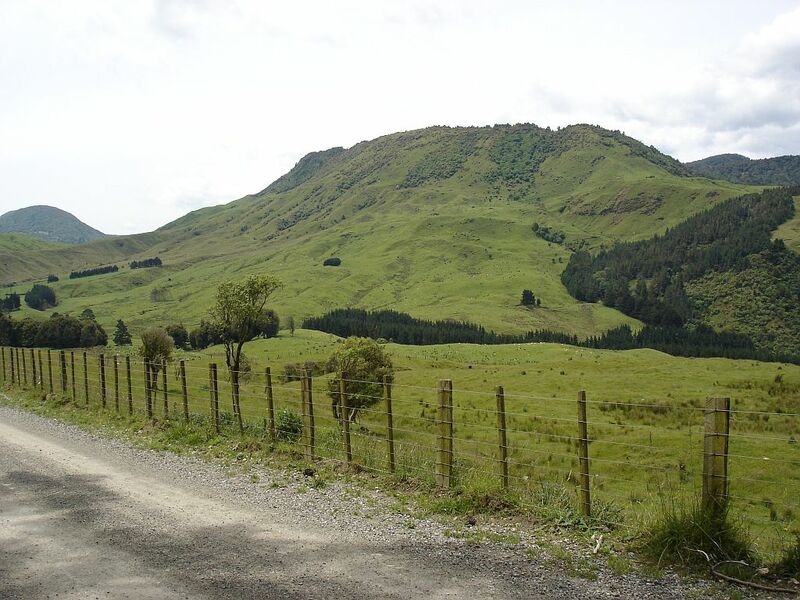 Continuing on the Motu Rd, the road soon narrows again, and leaves the farmland behind. 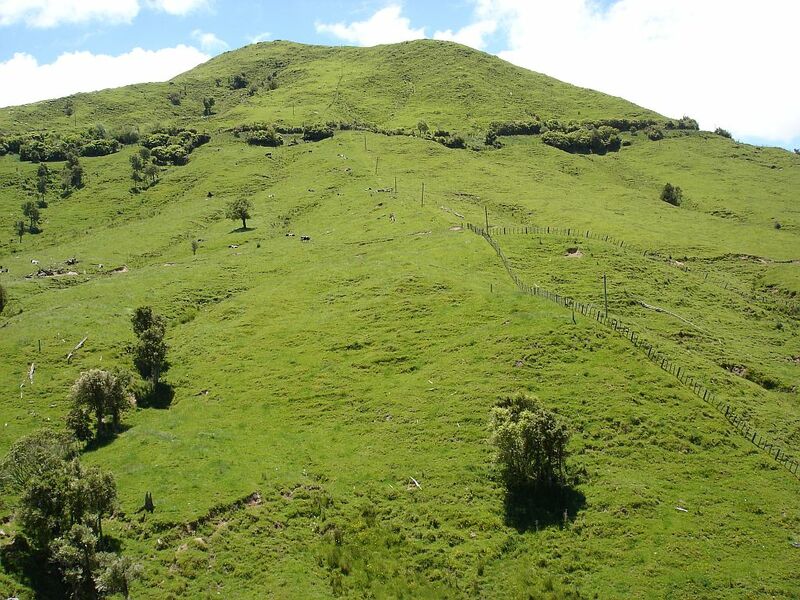 The hills get even steeper, and taller, with slips on the hillsides not uncommon. There is not too much room for two vehicles to meet, and not much visibility or warning of oncoming traffic. 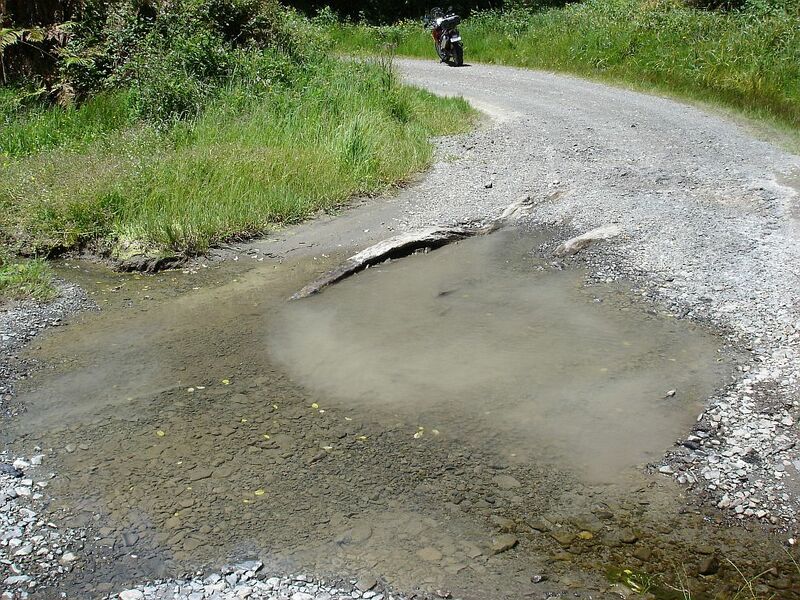 There’s even an occasional stream to be crossed, avoiding the tree roots or trunks buried in the road. 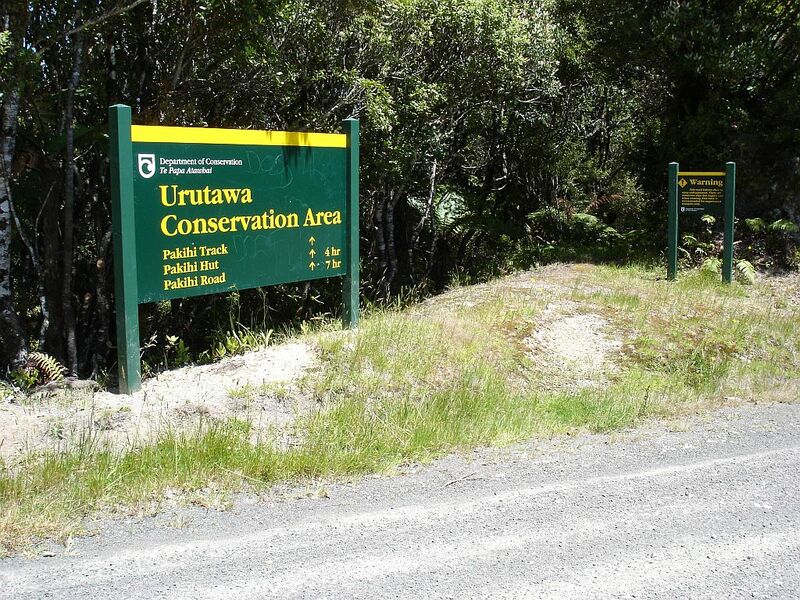 The Department of Conservation maintains a few tracks and huts in the area. 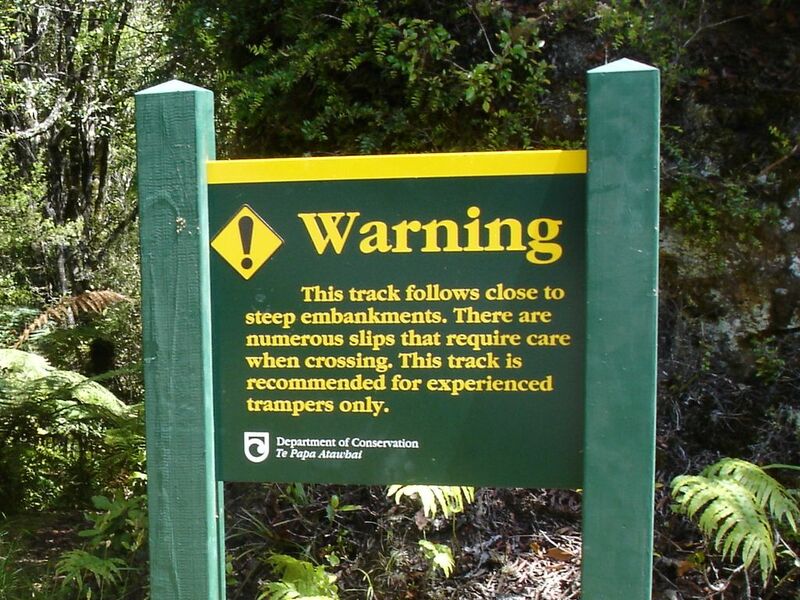 But they also warn you before attempting to walk these tracks. There are a few places where you can see oncoming traffic. Some distance away. And after having descended to the valley floor and ascended on the other side you can also see if anyone is following behind. Approaching Motu township there are more farms, as the steep, forested hills give way to more extensive valleys. 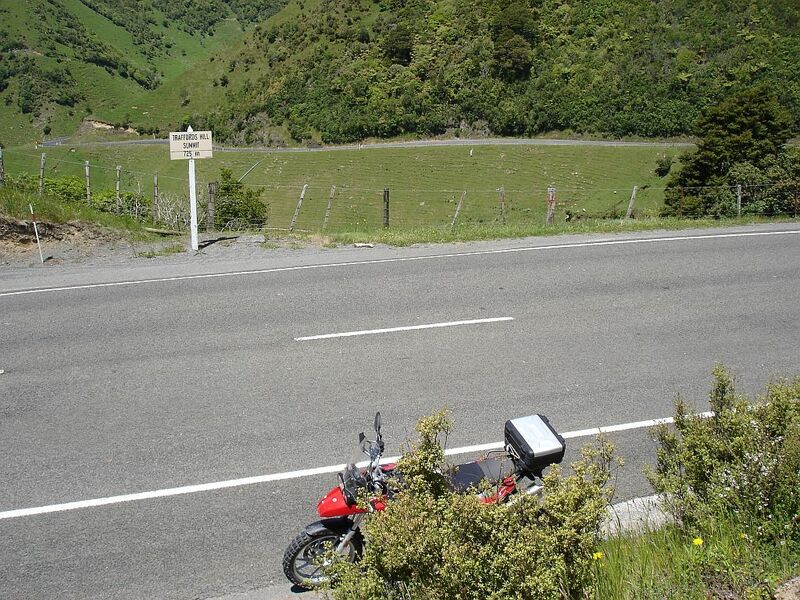 The hilltop is 737m above sea level, the road as it crosses the hill about 620m asl and the road where the picture is taken about 520m asl. 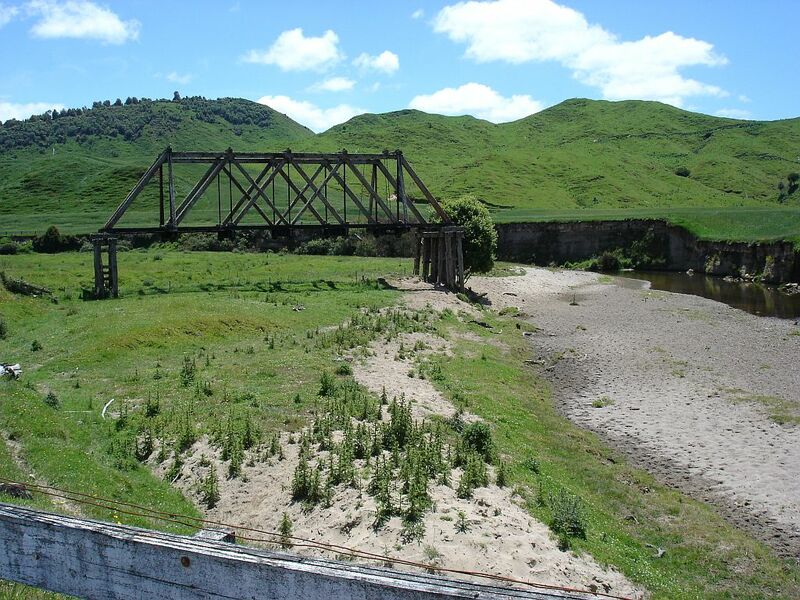 The Motu River is crossed at the entry to Motu township. The approach road can again be seen on the hillsides at top left of the picture. The warning sign at the southern end of the road is similar to that at the northern end. Although there is an extra warning about the permitted maximum length of vehicles. 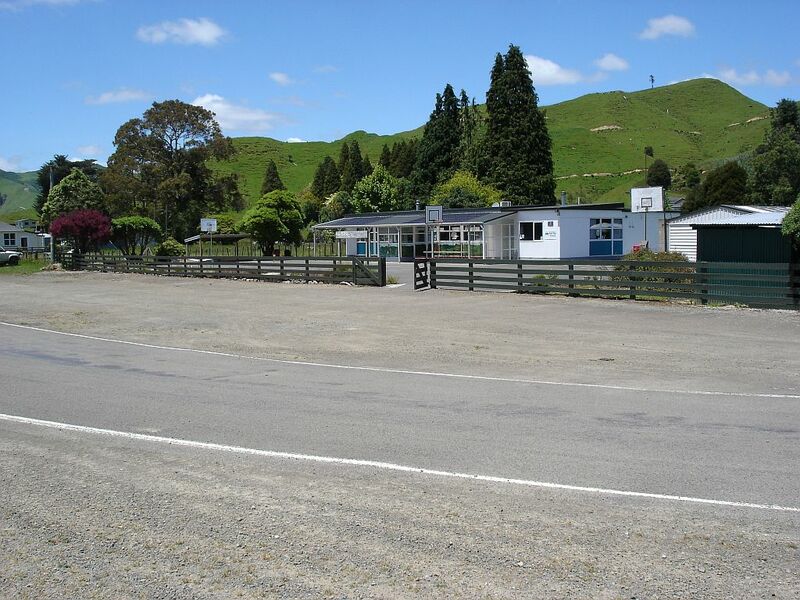 Motu township consists of a small school, a few houses, and not much else. Although it does have both a Queen Street and a King Street. Even some road signs get it wrong. 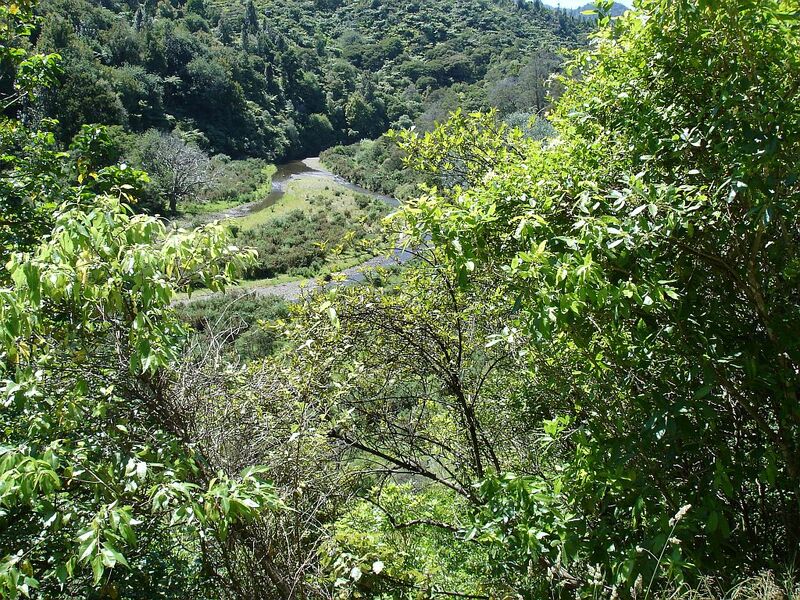 That should be Raukumara Forest Park, not Ruakumara. 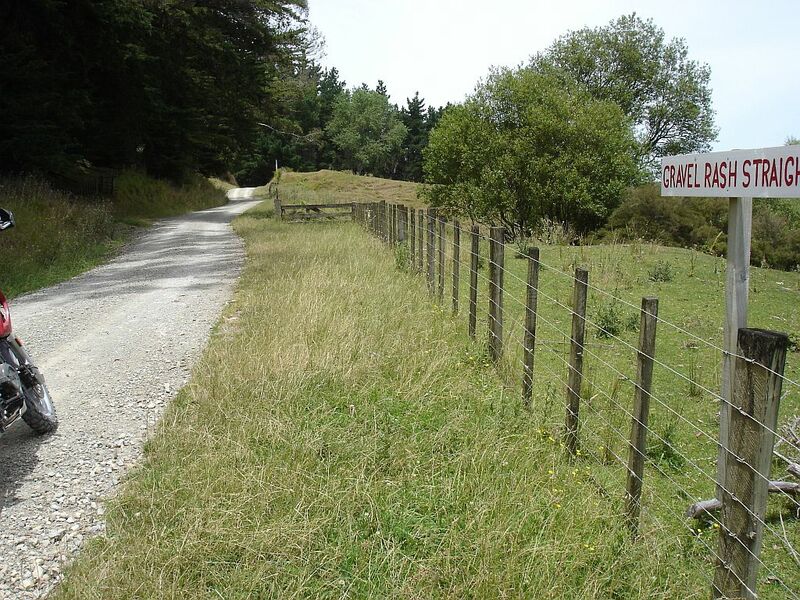 The sign at top left reads “Old Motu Rd”, the 48km long narrow winding road. 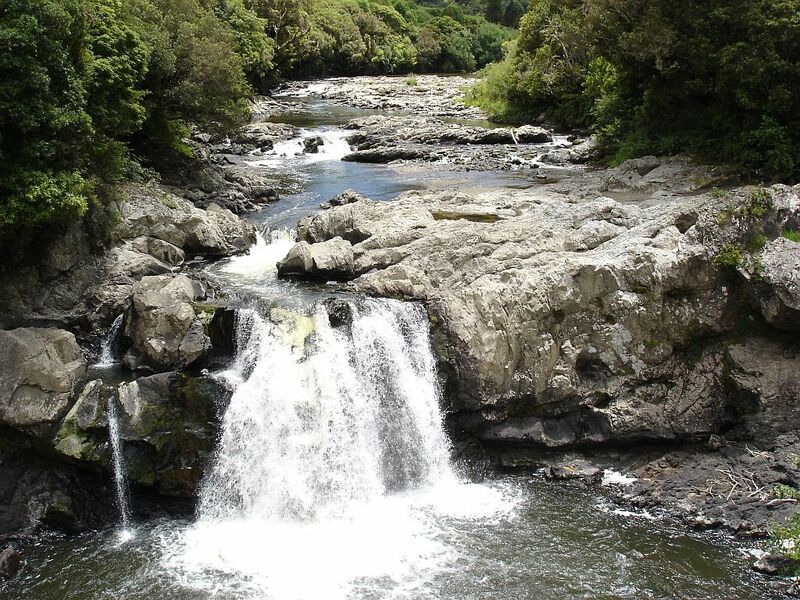 The Motu Falls are about 5km from the town, next to the road, but you need to brave a swing bridge to view them. 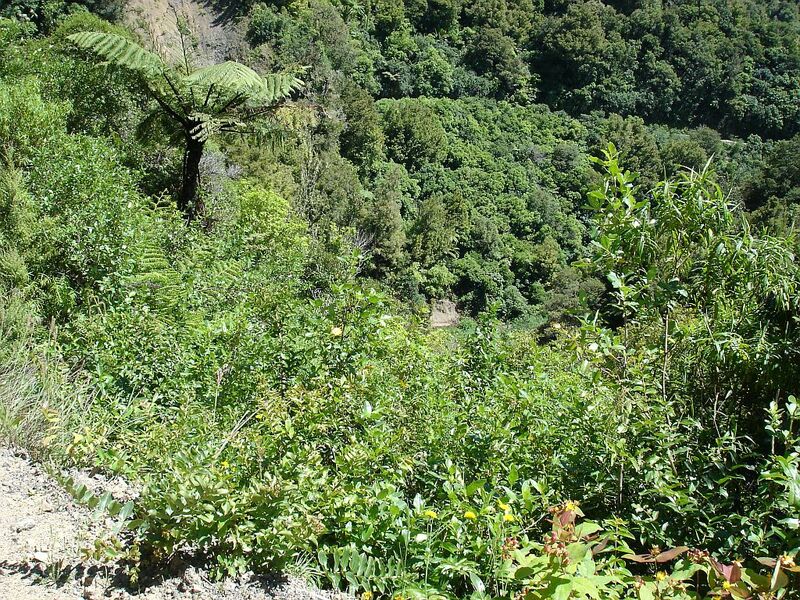 The road from Motu to Matawai is sealed. It seems the Motu River moves occasionally. Or the bridge has been moved. 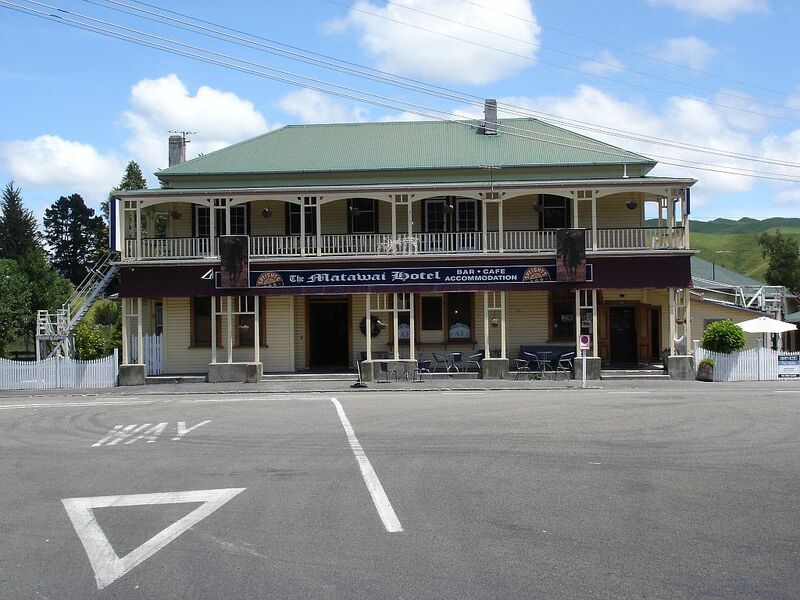 Motu Road ends just across from the historic Matawai Hotel, on State Highway 2. 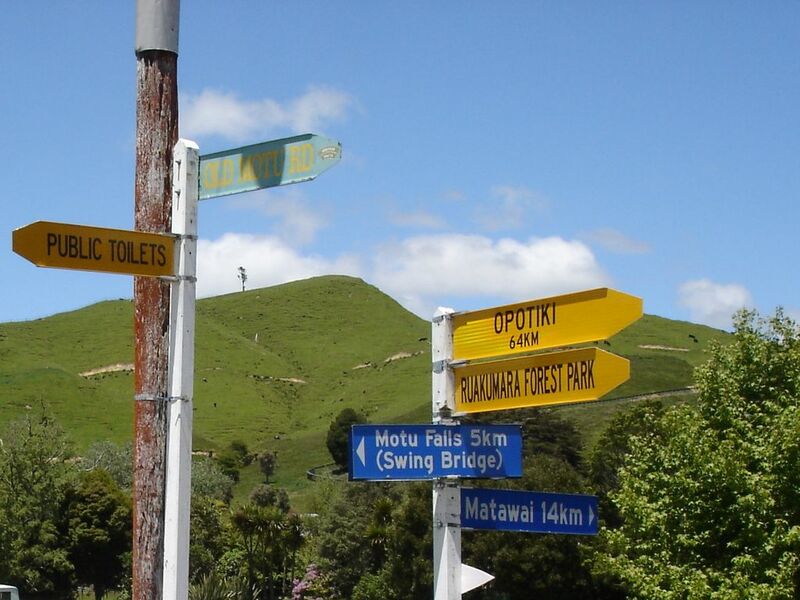 Here you turn left to continue on to Gisborne, or turn right to return to Opotiki by SH2. 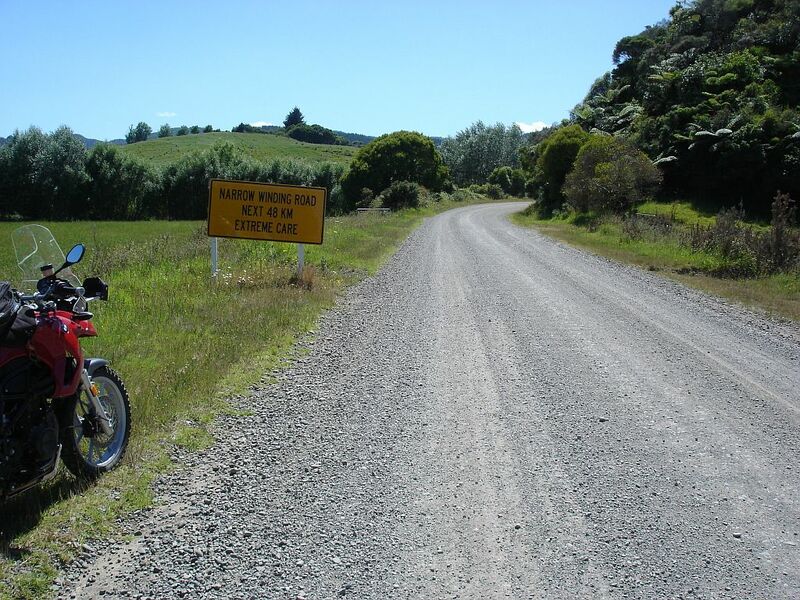 SH2 through the Waioeka Gorge to Opotiki is also an interesting road. It peaks at 725m asl. 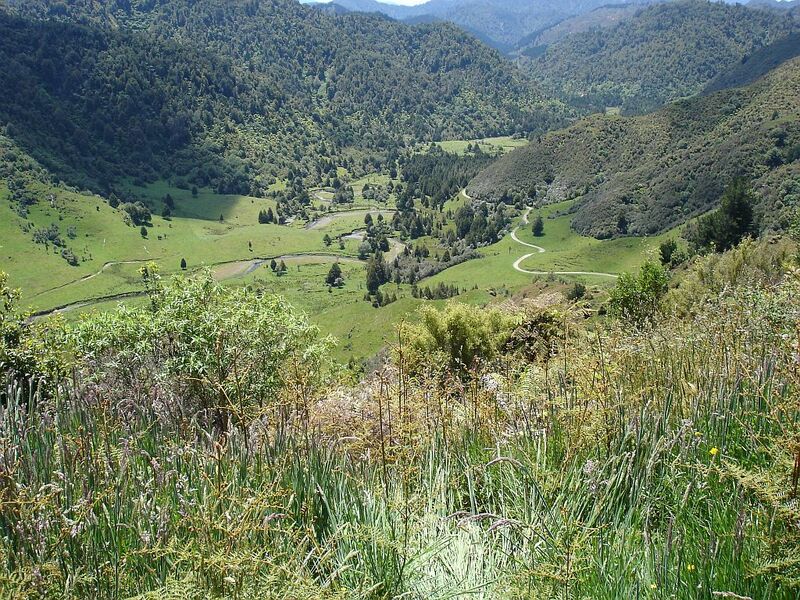 From there it’s downhill almost all the way as it follows the Waioeka River. Depending on the time of day and time of year there may also be the occasional obstacle to progress. 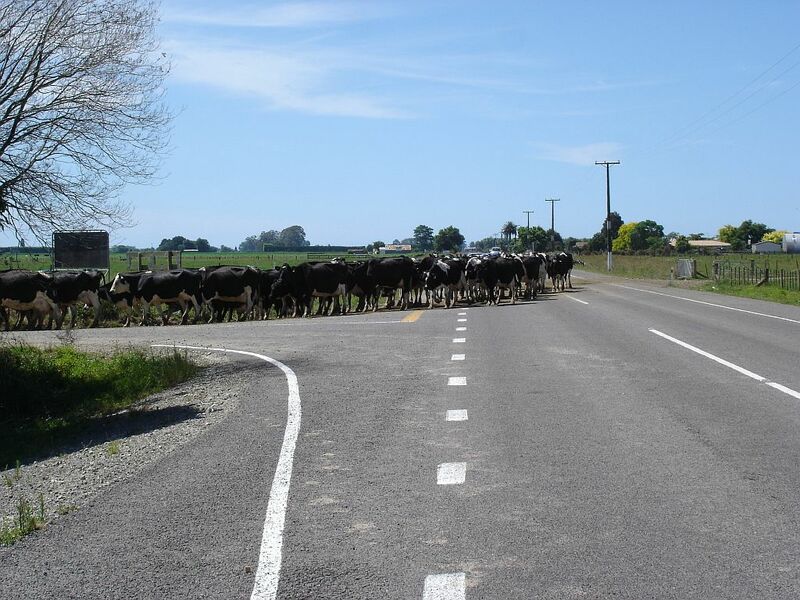 Fortunately the majority of the herd, probably about 300 cows, had already crossed the road. 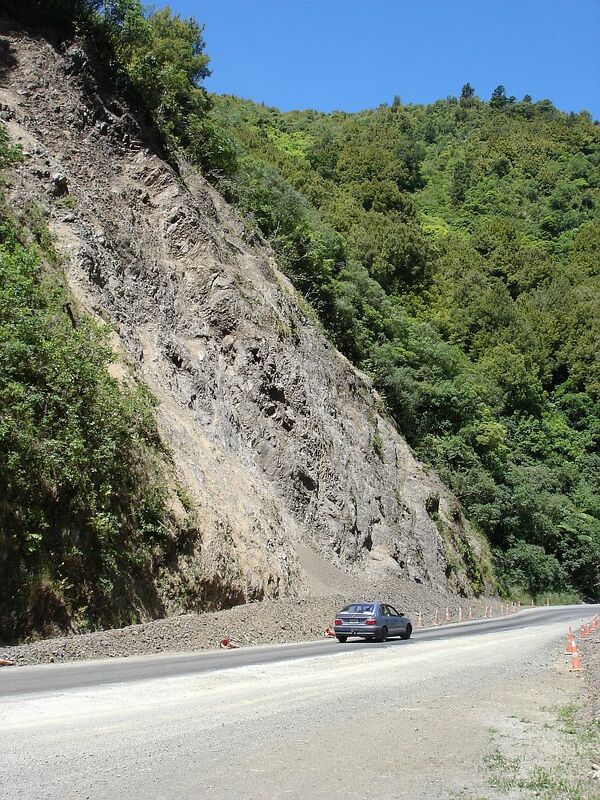 If you are continuing on from Motu to Gisborne or further south there are two alternative routes, bypassing most of SH2, and each with stretches of winding gravel road. 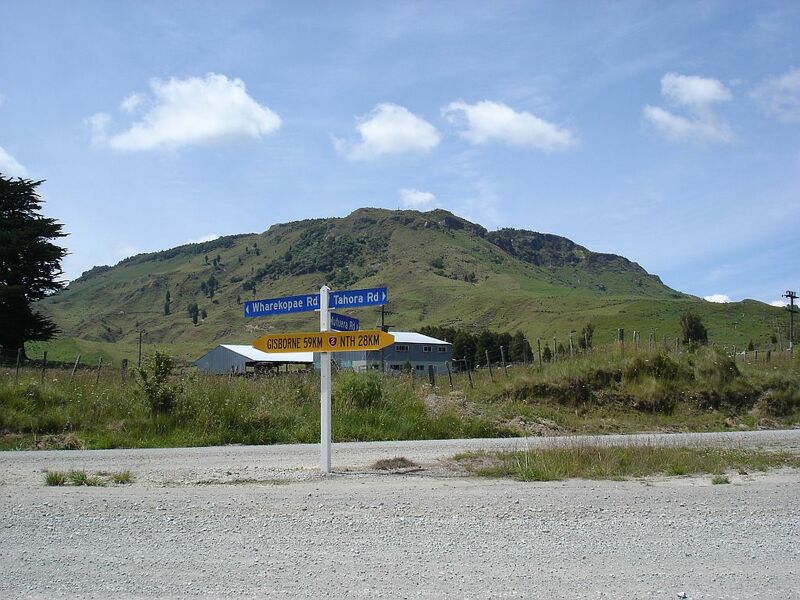 The one with most gravel is Whakarau Rd, which connects to the Motu – Matawai road about 3km south of Motu township. 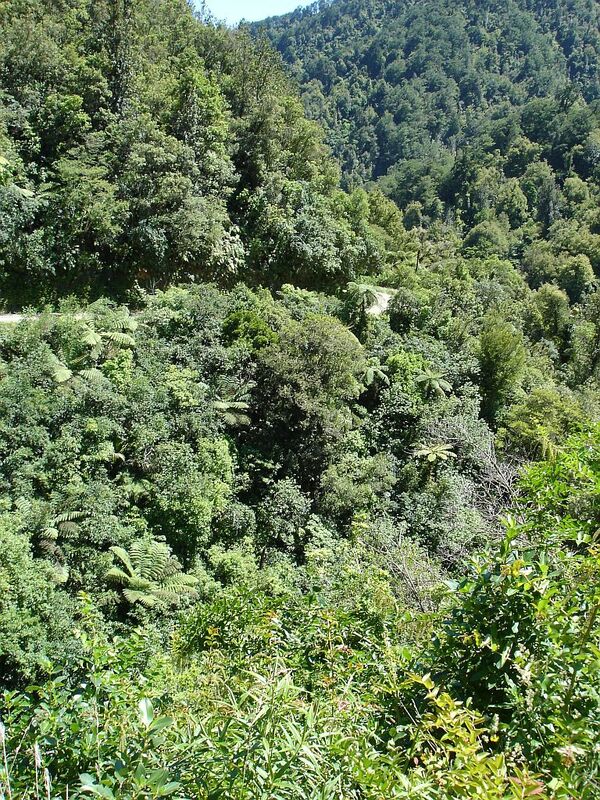 The road is almost 40km long, with only short lengths of sealed road at each end. 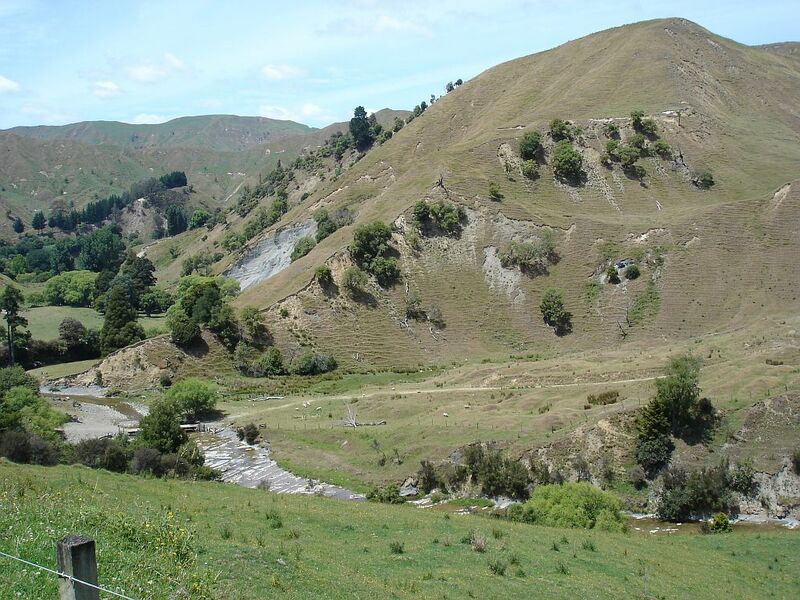 The south-eastern end joins up with SH2 about 10km north-west of Te Karaka. 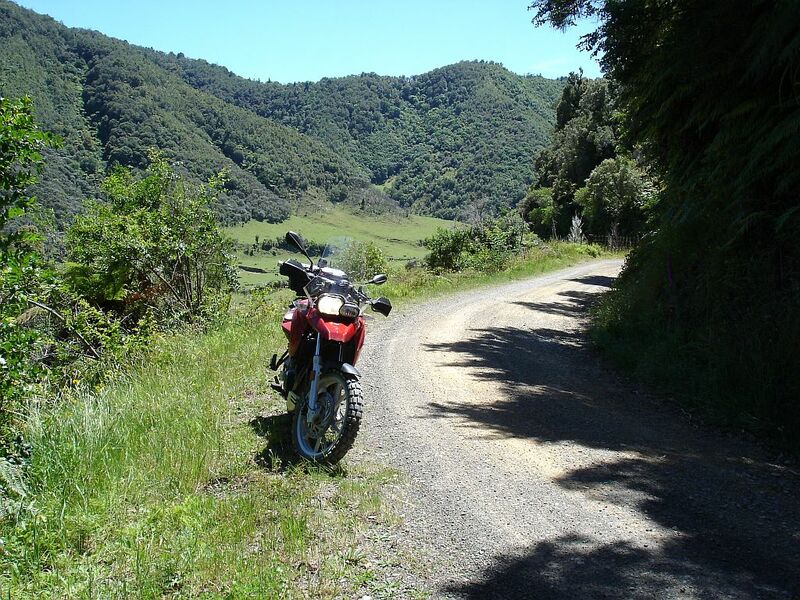 It is not as steep and winding as Motu Rd, but is almost as narrow. There is farmland for most of the length. 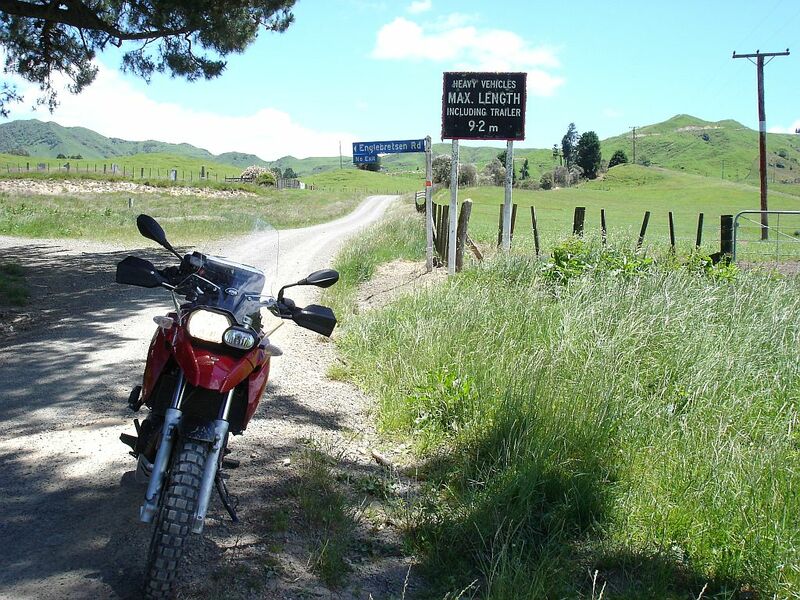 Another alternative route from Matawai to Gisborne and the south has about 20km of gravel. 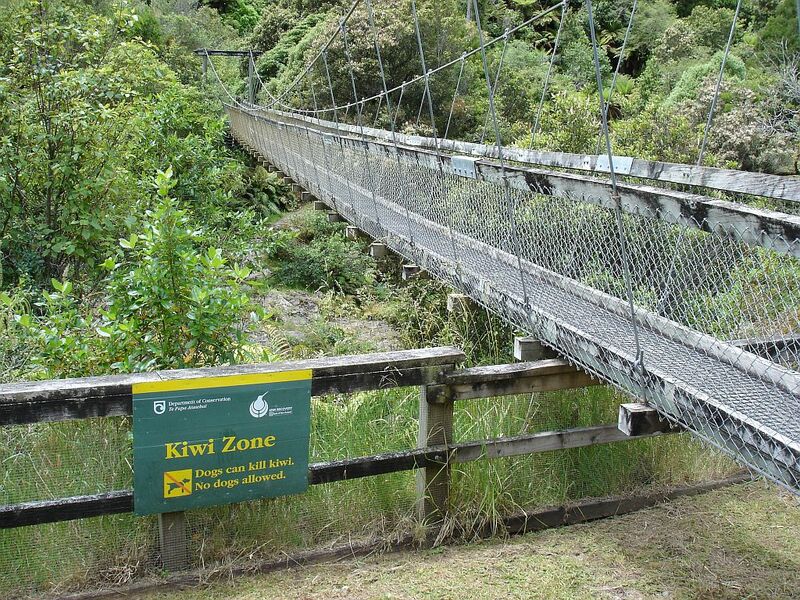 The route starts from SH2 about 7km west of Matawai, on the road from Matawai to Opotiki, next to a one-lane bridge. There are three roads to follow. 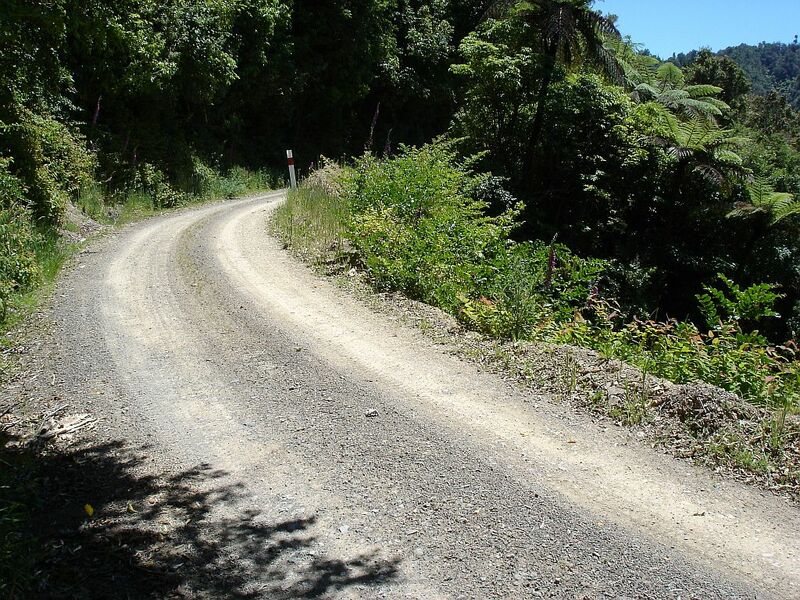 First is Te Wera Rd, which has a short stretch of sealed road before the gravel starts. 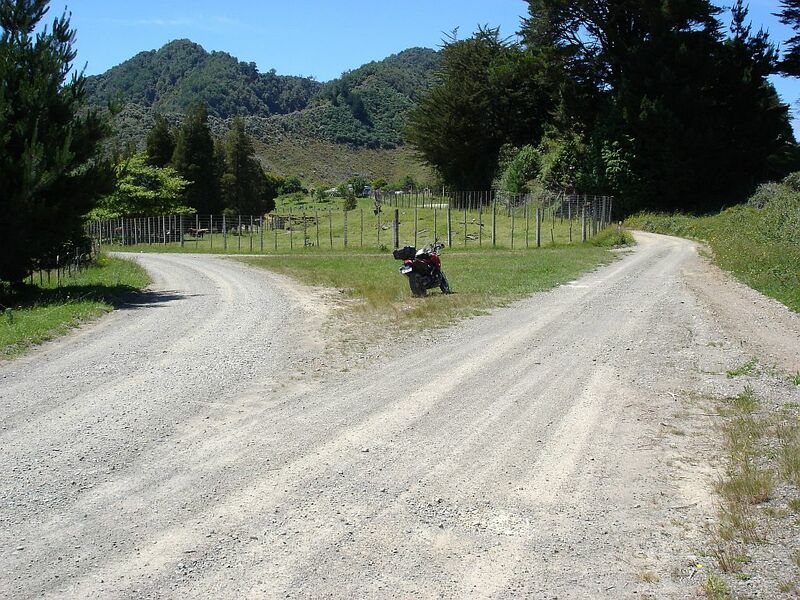 This continues on to Tahora Rd, which is all gravel. Tahora Rd continues on to Wharekopae Rd. 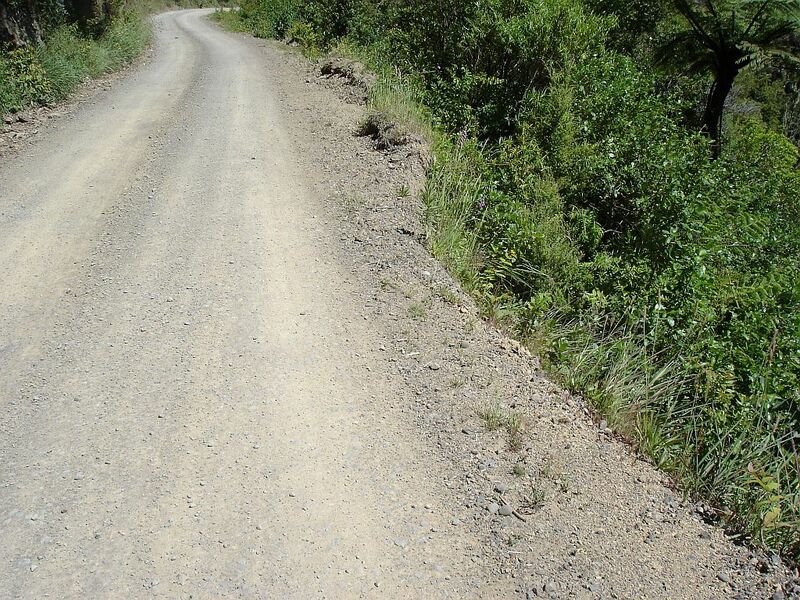 Wharekopae Rd is mainly sealed, but at the Tahora Rd end there is a stretch of gravel. 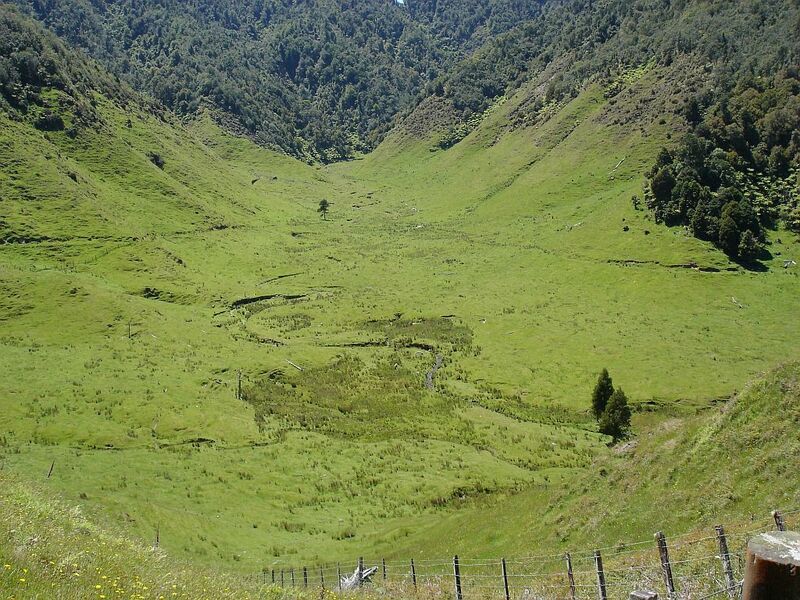 It passes by some steep farmland. 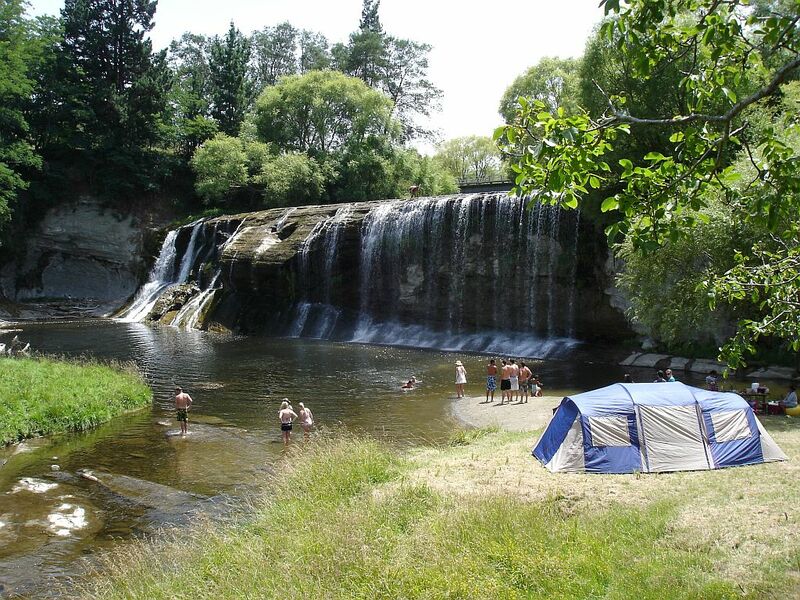 Rere Falls is worth a stop along the way. 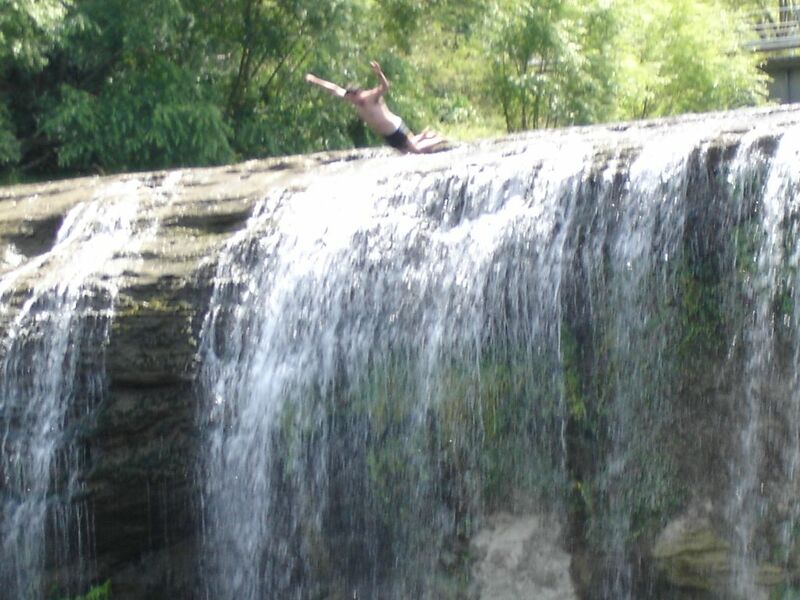 Note the guy at the top of the falls getting ready to jump. He did actually jump, as did several other young men. 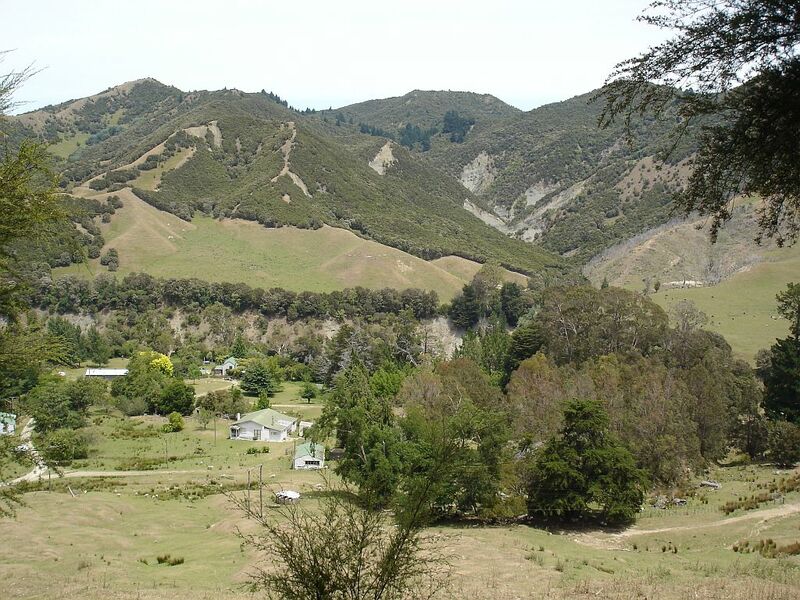 Wharekopae Rd passes by Eastwoodhill Arboretum, as well as several vineyards, before joining with SH2 west of Gisborne, at a roundabout, on the road from Gisborne to Wairoa. 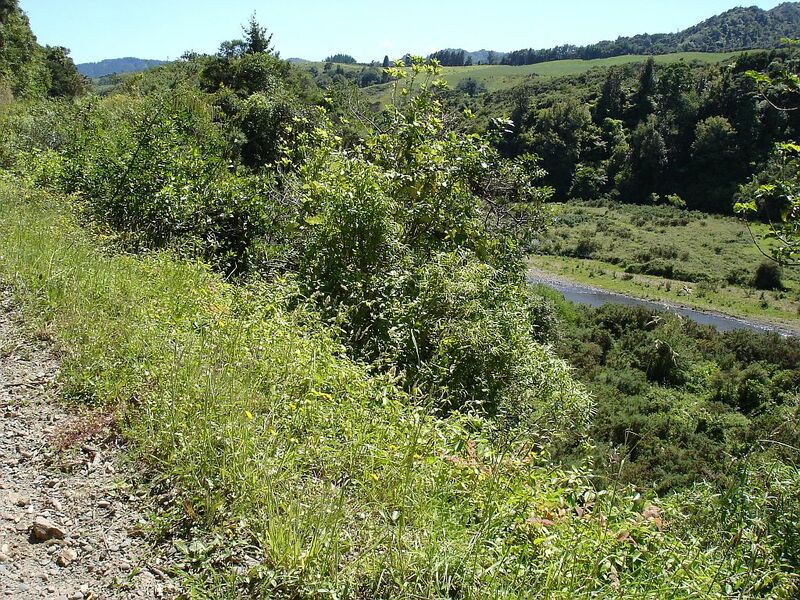 It is also possible to cross over from Wharekopae Rd to SH2/Matawai Rd at Patutahi, via Lavenham Rd.